Also known as inducible laryngeal obstruction (ILO), vocal cord dysfunction (VCD) describes the condition in which an adolescent athlete has no symptoms while at rest, but experiences respiratory shortness of breath with high-intensity exercise. What happens is that the glottis (the opening between the vocal folds) partially or completely closes. Symptoms usually resolve within a few minutes of resting. However, a history of mild asthma is often seen. 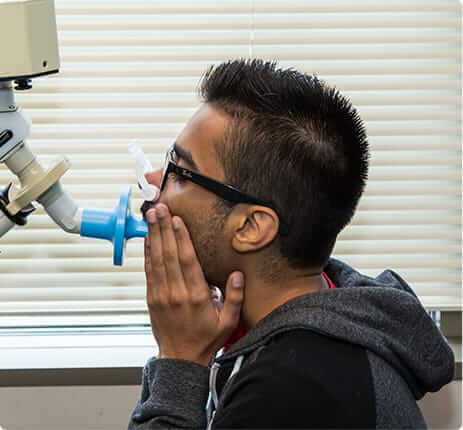 Diagnosis of VCD is made with appropriate history, a physical examination, and baseline lung function studies, with confirmatory exercise provocation and a laryngoscopy to rule out other secondary causes. If your child is experiencing vocal cord dysfunction, it may be time to have him or her tested at our Sports Physiology Center, where effective treatment can be recommended.